TNS is booming! We’re so excited to have so many passionate people coming out to dance each week and we can’t wait to share all the amazing classes we have in store for you next! Because November and December are both short months for classes due to holidays, we’ve decided to combine the classes within them into continuing 6-week series’! This means you’ll get to go more in depth and explore even more within our amazing classes! We are really excited! For the first three weeks of November and the first three weeks of December at TNS we’ll be diving down deep into solo and Tandem Charleston! *This will be a 6-week class taught over the course of the first three Thursdays of November and December. THIS IS AN INTERMEDIATE CLASS, STUDENT SHOULD BE COMFORTABLE WITH ALL THEIR BASIC CHARLESTON MOVEMENTS. For our exploring class this month we’re going to be teaching a 4 week introductory course on the fundamentals of Balboa. You’ll learn everything from the basic footwork and patterns of Pure Bal, to some more advanced Bal-Swing movements. This class is perfect for beginners, or intermediate students who would like to brush up on their basics. Don’t know what Balboa looks like? Check out this video HERE, for a great example of the beautiful elegant dance. *Since there is a holiday both of these months that shortens each of them to having only 3 Thursdays we can teach on, we have decided to combine the two months into one 6-week long class. This will ensure that we are able to maintain the integrity of the classes information and not have to rush through things in only three weeks time. The class will take place on the first three Thursday of Nov and Dec.
September At Thursday Night Swing! Fall is finally here and TNS is starting it off with a bang! This month we are super excited to have ALL OF THE BLUES DANCING! Including a month long INT Ballroomin’ Blues Class at TNS in addition to the one day workshop coming up on Sep 19th! And don’t forget, as always, if you pay for the entire month’s series the first Thursday of the month you’ll get a week free! Ballroomin’ blues began as jazz and swing music was being played in ballrooms like the Savoy Club and Cotton Clubs when the bands would play slower songs as well as the fast swing songs. Similar to the earlier techniques of Slow Drag, the dancers would dance to these slower songs slightly more upright, traveling across the floor, and with larger moves because they would have more space to dance in. Come out all this month and explore modern Ballroomin’ blues! Then on Sep 19th don’t forget to join us for a one day CONTINUING BLUES class on Jookin Blues!!! THIS IS AN CONTINUING CLASS CLASS, STUDENTS NEED PRIOR BLUES CLASS EXPERIENCE TO PARTICIPATE.. This month during the continuing Lindy Hop series we’re going to work on expanding your basic Lindy Hop vocabulary by teaching you some more advanced classic movement that every Lindy Hopper should know! THIS IS A CONTINUING MONTH LONG COURSE, STUDENTS NEED TO HAVE COMPLETED ALL CORE CLASSES TO PARTICIPATE. This class will focus on teaching the basic footwork of Lindy Charleston, both as a solo dancer and as a partnership. During the course of this class will be students will learn a wider vocabulary of solo movements to increase their own body awareness as a dancer in addition to a variety of partner movements they can have fun with on the social floor! And as always we’ll be teaching our foundations beginner class all this month as well! •Getting your body in sync with the music and finding the swing rhythm. •Learning the basic 6-count swing footwork. •Learning how to partner with a lead/follow. •Learning how to move around the floor with our partner. THIS IS A DROP IN BEGINNING CLASS, NO PREVIOUS DANCE EXPERIENCE OR PARTNER IS REQUIRED. May at Thursday Night Swing! 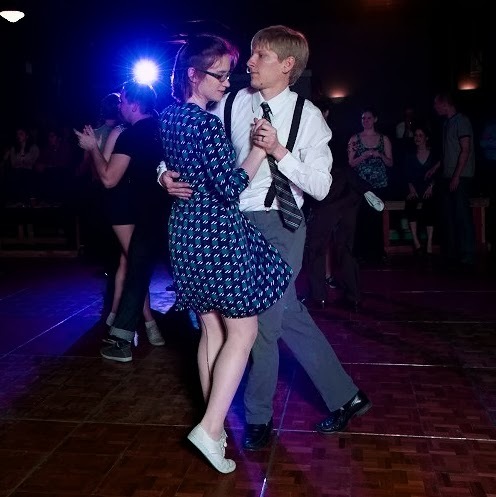 We’re back again for another month of awesome classes and swing dancing! This month we have even more amazing classes lined up including BEGINNER BALBOA!!!! Todd & Jennifer are here to help you take your Lindy Hop to the next level with this month long continuing Lindy Hop series at TNS. We have special guest instructors this month, Adam and Erica here to help take you from zero to Balboa in no time. Come out to TNS all month to learn the awesome dance! The dance of the roaring 20s! This outrageously fun and easy dance channels the high energy and bouncy rhythms of New Orleans and Dixieland style jazz. 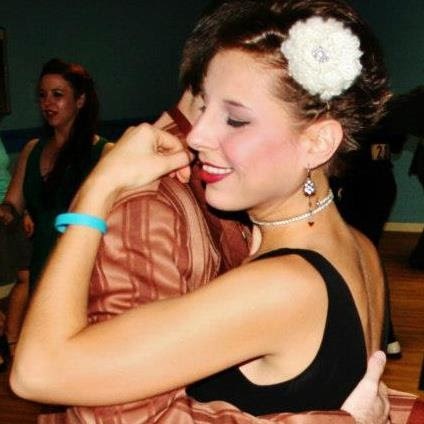 This class will guide you step by step through the basic charleston footwork and patterns and give you insight into the historical roots of Lindy Hop. We’re back for another month of awesome swing classes! This month we’ll be learning new choreography, exploring the classic stylings of original Balboa dancer Maxie Dorf and digging down deep into the core fundamentals of 6-count Lindy Hop! Jason and Danielle have a new routine they’ve choreographed just for you to learn this month! Be sure to come every week this month to learn the whole routine. We’ll even have the chance to perform it as a group later this year! This month we’ll be breaking down and exploring tons of signature moves and stylings from original Balboa dancer Maxie Dorf! THIS IS A INTERMEDIATE LEVEL CLASS, DANCERS SHOULD HAVE SOME FAMILIARITY WITH THEIR BASIC SET OF BLUES MOVEMENTS. This ain’t your mama’s six count swing class! This class will focus on teaching students the in depth technique and partnership connection skills that define Lindy Hop. On top of that, students will learn a wide variety of 6-count Lindy Hop movements to play with on the dance floor. We’re back for another month of classes and this month is extra special because we’ll be teaching two NEVER BEFORE TAUGHT AT TNS CLASSES! That’s right TWO classes that we’ve never taught before: Continuing Blues, and Core 30s/40s Charleston! We’re so excited to be adding these amazing classes to our monthly line up! Are you ever dancing and experience one of those moments where you have no idea what to do? Music suddenly got way too fast and you can’t keep up? Find yourself in a handhold you don’t know how to get out of? Well never fear because all this month we’re going to be exploring how to tackle these “oh no” moments. We’ll be throwing down four weeks of tips, tricks and techniques that will let you glide in and out of sticky situations without ever breaking a sweat! Get ready to slow down the tempo and dig into some more advanced blues concepts this month with Adam and Krystal! 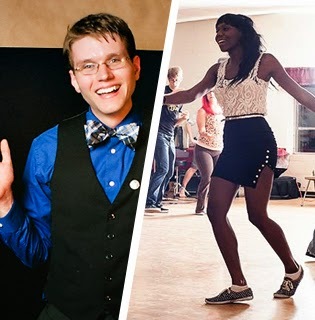 Adam and Krystal will be teaching 4 weeks of intermediate blues dancing where they’ll be breaking down more advanced rhythms, techniques and movements for you all month! This class will focus on teaching the basic footwork of 40s Charleston, both as a solo dancer and as a partnership. During the course of this class will be students will learn a wider vocabulary of solo movements to increase their own body awareness as a dancer in addition to a variety of partner movements they can have fun with on the social floor. January Classes At Thursday Night Swing! Get ready for another amazing year at Thursday Night Swing. We’ve got so many amazing things planned for you this year, we just can’t wait to get started! So first up in January we have some awesome classes starting up on JANUARY 8TH. But wait there’s more…. The first Thursday Night Swing of the year on January 8th will be absolutely free! Yep. You heard us right, ZERO dollars. So if you’ve been on the fence about coming out and giving swing dancing a try, here’s your perfect opportunity! We’re starting off the new year right with a scrubbing bubbles series for your lindy hop. We’re going to get down and dirty on technique so you can come out squeaky clean to start your new year on the right foot. So come prepared to roll up your sleeves, and get to work because we’re getting geeky with it. THIS IS A INTERMEDIATE MONTH LONG COURSE, REGULAR MONTH LONG ATTENDANCE IS HIGHLY SUGGESTED. STUDENTS MUST HAVE COMPLETED ALL 4 CORE CLASSES TO PARTICIPATE IN CONTINUING CLASSES. The dance of the roaring 20s! This outrageously fun and easy dance channels the high energy and bouncy rhythms of New Orleans and Dixieland style jazz. This month long class series will guide you step by step through the basic charleston footwork and patterns and give you insight into the historical roots of Lindy Hop. THIS IS A BEGINNING MONTH LONG COURSE, REGULAR MONTH LONG ATTENDANCE IS HIGHLY SUGGESTED. We made a lot of changes at TNS in October and we are so excited about the great response we’ve had all month from our dancers and can’t wait to kick off a new month of classes in November! This month is about improvisation in partnered dancing – the skill of varying your movement within the context of the pattern you’re doing. By the end of the series, you’ll have learned ways to vary rhythm, footwork and even basic moves depending on what you hear in the music. In December we’re going to be throwing down one of the most iconic moves in Lindy Hop, The Texas Tommy. We’ll show you the original and then get into some spicy variations for you as well! *This will be a 6-week class taught over the course of the first three Thursday of November and December. If you’ve been dancing for a while, then you know there is a point where classes aren’t what you need the most, instead you need direct personal feedback and dedicated practice time to hone the skills you already possess. Welcome to the refining room, a guided practice session that is designed to challenge intermediate-plus to advanced level dancers. Students will have the opportunity to work together, share skills and provide feedback to one another on their dancing. For these sessions, students will often work with a mentor or in peer groups dissecting a more complex movement or concept. Students also have the option to use the room as a practice area to work on anything of their choosing and gather feedback either from a mentor or their peers. The Refining Room is open every Thursday from 7:30-8:30pm in the space adjoining the Flying Monkey Theatre inside the Lowe Mill and is ABSOLUTELY FREE. I know crazy right? We’re kicking off October in a big way this month at TNS with some major changes! To start off, as you may have noticed, we have a brand new website! Take a look around, I think you’ll find some new fun and exciting things are happening at TNS! Our other big announcement is that we’ll be dividing the classes up into two time slots starting in October! The intermediate classes will start at 6:30 and run until 7:30 and the beginner classes will now run from 7:30 until 8:30 with open dancing afterward from 8:30-10:00. Why the big shift? Well, we’ve simply outgrown our space! 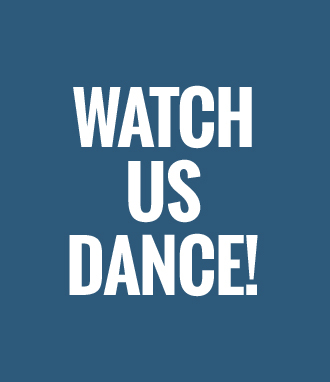 Not only that, but with two hours of classes we can now offer more regular classes in Balboa, Blues and Solo Jazz in addition to keeping a weekly intermediate Lindy Hop class running! We’re also using the extra time and space to offer a first time beginner fundamentals class each week that will allow our beginner core series to be more challenging and progressive and pack in more information that ever! But enough about all the changes! Here’s the awesome line up of classes we have coming your way this month! And remember, because of the time change beginners have TWO classes they can take this month! 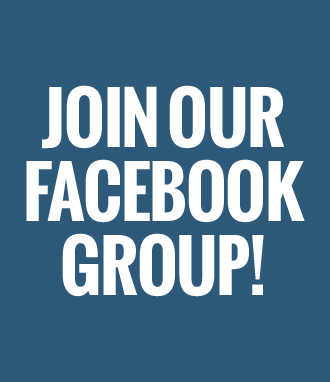 The 6-count Lindy Hop class AND the fundamentals of Solo Jazz! THIS IS AN BEGINNING CLASS, NO PREVIOUS DANCE EXPERIENCE OR PARTNER IS REQUIRED. Solo Jazz developed in the 20s with the Charleston crazy and combines elements of Charleston, tap and basic jazz and it’s absolutely essential for becoming a great Lindy Hopper, as almost all our footwork variations are inspired by solo movement. Solo Jazz is also the perfect opportunity to work on quality of movement. Since you don’t have a partner at the end of your arm, dancing with your whole body become much more important. During this five week series Paul is going to walk you through the essential ABCs of Jazz steps and build up your vocabulary, then Danielle is going to challenge you to put them all together! THIS IS AN ALL LEVELS CLASS, NO PREVIOUS DANCE EXPERIENCE OR PARTNER IS REQUIRED. Fall is finally here and TNS is starting it off with a bang! We’ve got THREE, yes THREE classes this month for you! I know… however will you choose? This includes our first ever month long BLUES SERIES! Eeee!!! I’m so excited! In addition, we’ll also be teaching an Int/Adv Balboa series! So if you made it out to our July beginner series, or Bal-ast off and just can wait to learn more Balboa, this is your perfect opportunity! The dance of the roaring 20s! This outrageously fun and easy dance channels the high energy and bouncy rhythms of New Orleans and Dixieland style jazz. This class is perfect for those new to swing dancing and will guide you step by step through the basic charleston footwork and patterns. Get ready to slow down the tempo with this four week introduction to blues series! This series will focus on giving you a solid foundation in the unique aspects of the blues dancing partnership, musicality, rhythms and movement! This class will be the perfect follow up for those taking our one day blues workshop on Aug 30th! – Taught By Adam & Krystal WilkersonTHIS IS AN BEGINNING CLASS, NO PREVIOUS DANCE EXPERIENCE OR PARTNER IS REQUIRED. You asked for it, so you got it! This month we are teaching THREE, yeah you heard me, THREE classes! For our third class we’re going to be picking up right where our July beginner Balboa series left off with an Int/Adv Balboa class! Students will have the opportunity to increase their Balboa vocabulary in addition to refining and developing more advanced technique in this four week series. THIS IS A INT CLASS, STUDENTS NEED TO BE PROFICIENT IN ALL BASIC BALBOA MOVEMENTS (i.e. toss outs, lollies, out & ins, basic footwork, etc.) TO PARTICIPATE.